Crafted in lustrous 14ct white gold, this mesmerising 1/2ct diamond ring from the Ever Us range is set with two dazzling round cut diamonds to symbolise the long term commitment between you and your best friend, your true love. 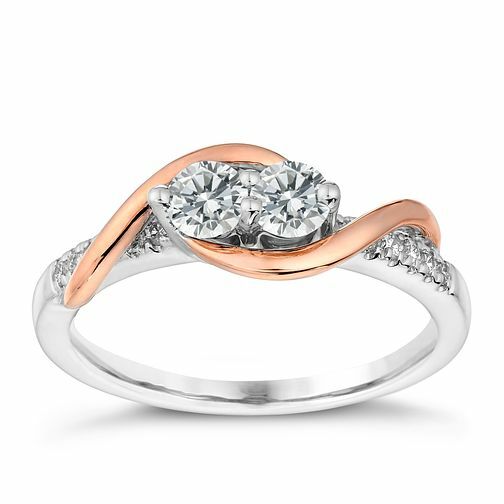 Flanked by diamond set shoulders and twisted in rose gold for a gorgeous finish, this stunning piece is designed to be treasured. Ever Us 14ct rose white gold 0.50ct 2 stone diamond ring is rated 4.3 out of 5 by 3. Rated 5 out of 5 by Anonymous from Looked long and hard for an Engagement Ring Been engaged for 1 year, bought this ring for my fiancee. I wanted to get the more expensive version but out of stock and out of price range anyway. She tells me she loves it. Just need to find a wedding ring that will match.